my names peter i live in caboolture qld. im new to bow hunting and im mad keen to meet people and hope to get out for first bow hunt soon. i was a member of the old forum for 2month before the so and sos wrecked it i found it great help to get me set up with my first bow and gear and was also a daily reader. lots of great stuff here keep it up. Antonio here and I live on the South Coast of NSW. I work full time in the Bluescope Steel plant here at Port Kembla. Am married with two girls, 8 and 5 years old. Also edit and publish South Pacific Bowhunter magazine, so life is pretty full with the site side of things to deal with as well. Love my bowhunting and can't think of anything I would rather be doing. Mainly hunt Rusa deer and cut my teeth on them. [SIZE="2"] Ashley Johnston. current equipment: hoyt alphamax 32 shooting Carbon Express Piledriver Passthru Xtremes , two blade Magnus Traditional broadheads, G5 three blade montecs and G5 SGH (small game head). QAD ultra rest, HHA single pin sight. 3DAAA setup: PRIME Impact in Target red, sureloc Supreme sight, titan scope, spott hogg edge, carbon express CXL pros. Name's Luke. No surprises there. Most members who have been around the traps for a while will know me well, but some newbies most probably will not. I started this site (well, not "this" site but the one that was hacked and destroyed) what will be 10 yrs ago on the 21st of September this year. Among other things, I was also the designer of the entire first 2 editions of the Bowhunter Australia magazine and responsible for approximately half of the 3rd edition (the last one before it changed to the new SPB magazine). October last year saw me step back from my role here as an active Admin given a change in career path, together with a move to Switzerland (from China), as well as several other personal reasons after around about 9 years at the helm. Apart from photography work, I have had to put the hunting on the back burner as it is illegal to hunt with a bow in Switzerland. It is likely at this stage that a return to Oz this time next year is on the cards and the lost time will definitely be made up for. 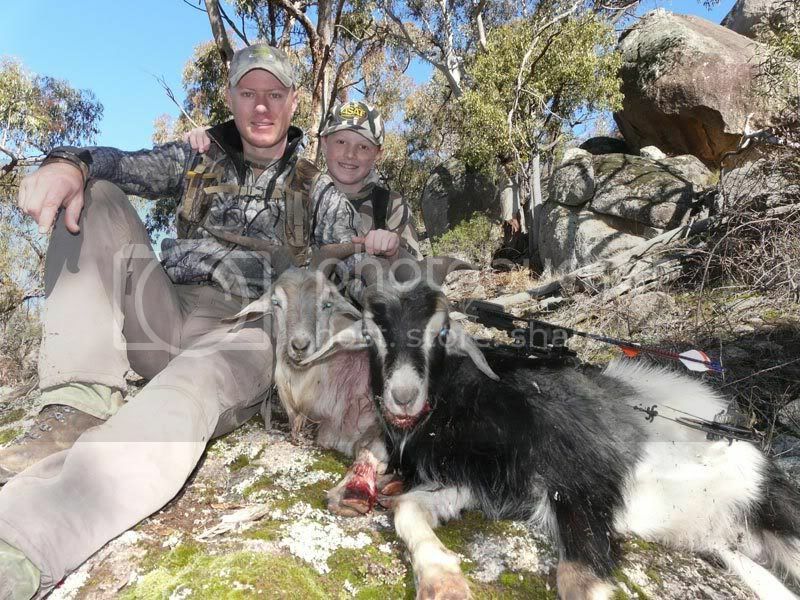 Finally, here is a pic of my with my favourite hunting partner, my son Taylor and a couple of goats for the pot. Last edited by Luke; 11th July 2018 at 01:07 PM. gday all.my name is max preece,im 17 and got into bowhunting about a year and a half ago.im currently chasing my first deer and fox. I'm Dave. 18y/o from Armidale NSW. I work as a subby in and around Armidale. Been chasing critters all my life but learnt to use a bow about 3-4 years ago. Love every aspect of archery and the Aussie bush, if I'm hunting or shooting 3DAAA. G'day all, Alan here, am 35 years old and live in Darwin, NT. I'm a senior investigator with the Commonwealth government, love my bowhunting and spend most of my free time these days trying to stop my 11 month old boy from stalking my golden retriever into the ground. I'm also a freelance photographer and writer in what little spare time i have. Nice to be here once again! 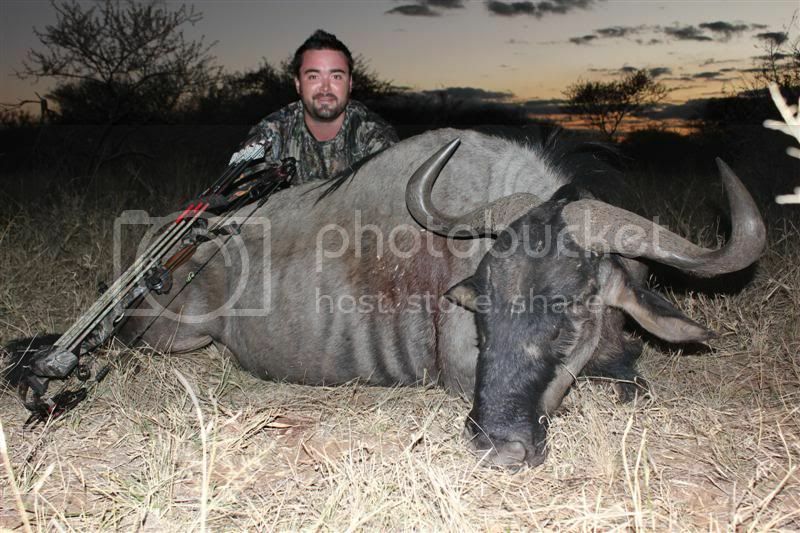 My name is Ben Salleras (many call me Butcher), and I've been a bowhunting addict for over 20 years now. I was walking around the scrub behind my old man chasing pigs with a little longbow at age 7, and have very slowly progressed from there. I was born into the Tully Bowhunters Club, and remain an active member to this day. I'm not far off being married, have no kids, and work as an environmental engineer for one of the larger petroleum companies. Currently I live in Chinchilla, about 4 hours west of Brisbane, although I grew up in the rainforest country around Mission Beach/Tully. I get out hunting as much as I can, and treasure every moment I get to spend with my mates out in the bush. Historically I've mostly chased boars up the Cape and Chital up north, but have recently started to broaden the horizons. Hunting internationally has always inspired me, and I hope to be able to hunt as many species around the world as possible during my time. I look very much forward to seeing this community rebuild over the coming months, it's been a real blow for us, but rest assured it will all come together again soon. G'day all , names timmo from coffs HBR now live in perth love the hunting scene but been out of the game for some time due to work commitments (army) but back in the game now i use to shoot an old Hoyt Prohunter but now have upgraded to a newer bow a BOWTECH OLD GLORY not bad and already looking at getting rid of it for a swtchback hope to have some pics up soon.